Has anyone tried to cut 40 gr 22 TCM bullets to make 22 TCM 9R length ammo? Any secrets to doing that? - Thu Mar 30, 2017 2:04 am #13747 What's the difference in overall length? 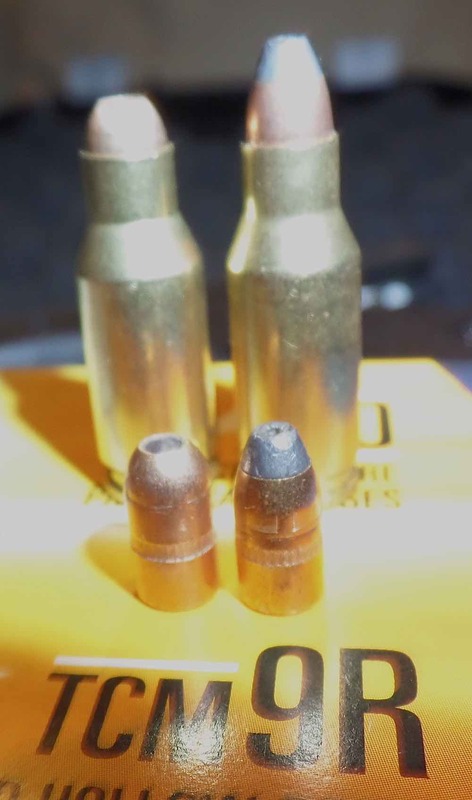 Any reason you can't just seat your bullets a little deeper and maybe drop y our powder charge a half grain or so? Or, just try a different bullet to get the OAL you desire. On the surface, it sounds like a lot of putzing around to achieve your goal. - Thu Mar 30, 2017 12:40 pm #13755 First thing that comes to mind -- why not just buy some 9R ammo? If I were going to do this, I'd weigh a loaded round, file the tip of the bullet to the desired length, and weigh it again to determine how much weight you've removed. If it's not too much, and you wanted to shorten a bunch of them, I'd use my El Cheapo Harbor Freight chop saw to get the job done. The BIG BUT is that I don't think I'd do it at all, but that's just me. - Thu Mar 30, 2017 6:37 pm #13764 Only thing I know for sure is that the 9R is listed as a 39 grain vs 40 for the TCM. Looking at the two bullets, it looks like it would take both circumcising and a deeper seat. I think if you just tried seating a TCM bullet to 9R depth, the base would extend past the case neck which probably wouldn't be good. Lend the gun to someone you don't really like to see how it works though. To the eye it looks like it would be easy as 9R doesn't seem to be available for reload. - Thu Mar 30, 2017 10:06 pm #13769 Had no idea of what 9R looked like, but your photos reinforce my first thought -- if you want to shoot 9R, buy it. Sometimes you can get away with playing with fire, other times you get burnt. Think about it. - Mon May 29, 2017 11:36 pm #14437 Is there a source for the 9r bullets? - Wed May 31, 2017 7:31 pm #14541 There haven't been any of the 9R bullets available as of yet, only the standard 40gr HPs. - Fri Jun 09, 2017 5:59 pm #14621 For the 22 TCM 9R has anyone tried the 34 HP Varmint Nightmare X-Treme bullets from Midsouth Shooters? Or would the HP design of the bullet be too long? - Fri Jun 09, 2017 10:40 pm #14623 Those 34gr are suppose to be the same as Midway USA Dogtown's and are longer then the standard 22 tcm bullets. So my impression is that they would not work for 9r use.